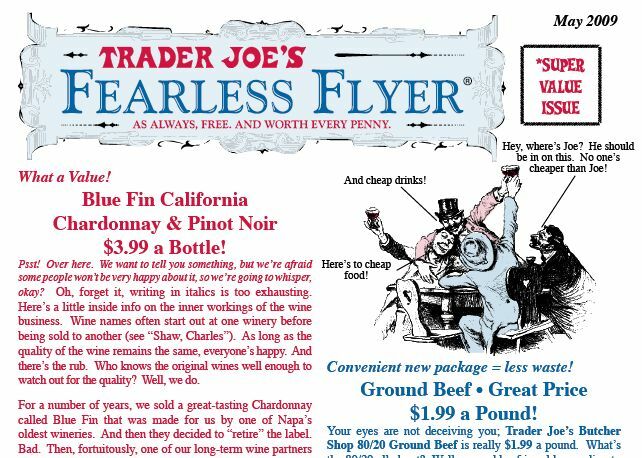 Trader Joe’s Triumphs over Competition. According to Forbes Magazine, Trader Joe’s tops all other grocery chains in customer service satisfaction. After The results of a study done on consumers in North America, Trader Joe’s ranked first on atmosphere and fast check out, and second in cleanliness, courteous staff, merchandise selection and accurate pricing. The interesting part to all of this is that it did not make it into even the top five of convenient location, low prices and one-stop shopping. The fact that people choose Trader Joe’s for the atmosphere and customer service over low prices and convenience tells us that there may be more to where and how we shop than good deals and ideal locations. While we may choose a grocery store for its prices and selection, it is the atmosphere and employees that keep customers loyal. Trader Joe’s prides itself in offering shoppers a friendly experience and unique experience from the traditional grocery store.Trader Joe’s strives to keep their customers happy and make their shopping experience as enjoyable as possible. The store is inviting and easy to navigate, the employees are dressed causally and always appear happy but most importantly the store takes the extra step to create an identity that the customer feels like they can connect with. 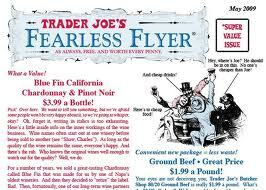 Trader Joe’s attempts to tell a story through their store and find ways to appeal to their customer’s senses. By empathizing with their shoppers they can offer the best products for their happiness, health and wallet, which, in return, helps them with customer satisfaction and overall retention. Many companies, like Trader Joe’s, try to appear more approachable than their competitors by using the idea of Corporate Storytelling. They try to show us they are real people with real stories versus a box store or mega corporation. If you take a look at the Trader Joe’s website, they have an entire timeline starting from the first store to today and a page on the story of the company. The writing is friendly and casual, inviting us to interact with them and develop a relationship with the store. Other ways they work to connect with the shopper is through their Fearless Flyer newsletter. Each month they choose store items and invite customers to try new recipes, give feedback or come in for seasonal favorites. During the month of October, Trader Joe’s is featuring Pumpkin flavored items and consumers are eating up the Pumpkin Bread Mix, Honey Roasted Pumpkin Ravioli, and of course the Pumpkin Spice Coffee. By paying attention to the items customers want and offering a pleasant place to do your shopping, Trader Joe’s humanizes their company and moves away from the traditional cold and sterile grocery store environment. By creating a genuine identity and a story to support their actions, they differentiate themselves and offer a unique shopping experience. Congruity. That’s a word that comes to mind when trying to explain why TJ might score so high. Do grumpy people or misers even go to TJ? Everyone I know who is a TJ fan is a lot like the staff of TJ: energetic, healthy but not co-op level creepy about it, fun, humble, easy going. It just seems like everyone there listens to “Wait, Wait, Don’t Tell Me!” on NPR and probably has (or wishes they had) a Subaru. The cool thing about TJ is they know who they want as customers and are OK that others might walk on by or not “get it.” Costco is a very different experience but seems to have a similar clarity. So, it’s the clarity that’s the separator, not the organic bananas vs the 32 pack of deodorant. When clarifying the brand a team must also be able to answer “who are we willing to lose or have walk away?” That’s when you know you are committed to the story and not the spreadsheet. Thank you Dr. Olsen for your feedback! I definitely agree with you on the congruity aspect. They have developed a story that remains consistent throughout the store and the company understands that not everyone is going to believe or even like it. Like you said, what makes Trader Joes committed to their story is the fact that they are willing to accept that their store is not for everyone but stick with it anyways. I personally prefer a store like that versus large box stores that try too hard to meet everyones needs. I think by staying small and focusing on the customer experience, Trader Joes understands they may connect with a smaller population but know that they have a better chance of retaining those customers for a long term relationship.